At Greene Hill we approach the teaching of reading and writing holistically and joyously. We ensure that our expectations of children are attuned to what we know about typical patterns of development. Children progress through emergent literacy stages into becoming true, independent readers and writers, engaging with the written word with zest and confidence. The 5s and 6s participate in intensive small-group work with teachers, as the children hone decoding skills, always keeping comprehension and enjoyment at the center of their reading work. Children use writing across the curriculum as a means to form and communicate ideas; they also focus on particular genres of creative writing. Using a constructivist and systematic approach called Words Their Way, children identify and use predictable spelling patterns and work on committing certain high-frequency words to memory. Developing skills are assessed through teacher conferences and observations, periodic benchmark assessments for reading, and checklists or rubrics specific to the writing genres they study. Greene Hill students experience reading and writing across many contexts and genres, enjoying literature independently and socially, conducting research, reading and interpreting primary sources, writing and speaking persuasively, and analyzing texts in increasingly sophisticated ways. Their teachers come to know them deeply as readers and writers, and assess their growth through a variety of measures, including frequent observation and conferring, periodic assessments with benchmark books, and writing rubrics tailored to specific projects and genres. As children are becoming more skillful at composing their thoughts, they are also working toward mastery of the physical logistics of writing. In the 4s, as children are learning to identify letters and the sounds they make, they are also involved in multi-sensory experiences that help them form letters and numbers correctly. Explicit handwriting instruction begins in the 5s and extends through the 10s, using a program called Handwriting Without Tears. 5s, 6s, and 7s learn and practice correct letter formation in print to acquire fluency and stamina as writers; 8s begin to study cursive, and start using cursive more consistently in their own writing by the 9s. Children continue to practice handwriting skills through the 10s. Keyboarding skills are taught beginning in the 8s with a program called Typing Pal; children in the 8s, 9s, and 10s practice their keyboarding skills at school and at home. By the end of the 8s year, students are ready to use computers to publish written work. In the 9s, they are beginning to compose directly on laptops. Our approach to spelling instruction is called “Word Study,” based on a program called Words Their Way. Through games and activities including word sorts, students gain a general knowledge of English spelling and learn how to examine words through active explo- ration using a hands-on, manipulative approach. They learn the regularities, patterns, and conventions of English orthography needed to read and spell, understanding over time how the layers of alphabet, pattern, and meaning apply to spelling. Students also discover generalizations about spelling, instead of just spelling rules. Similarly, they attend to correct grammatical usage and punctuation over time by examining good writing together, noticing patterns and anomalies, looking for rules, and experimenting with usage. Early literacy activities and experiences are embedded in the daily work of the 4s. Children listen to books read aloud, sometimes studying particular genres like fairy tales, and share books with each other. 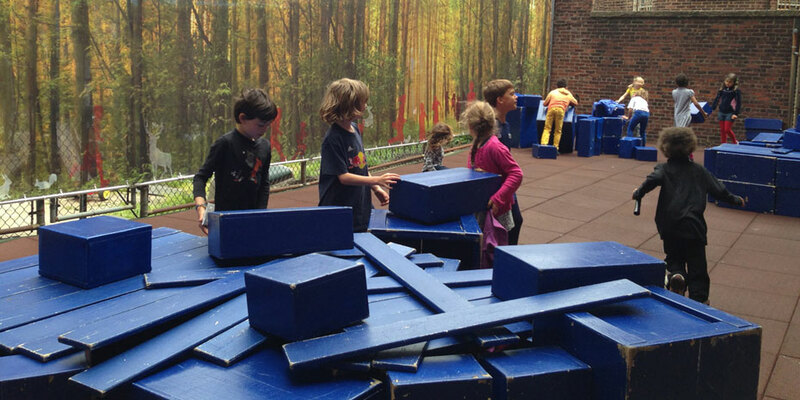 Children tell each other stories that grow from communal play in the block area, or from a child’s painting. They use blank books to compose stories or record every- thing they know about someone or something close to their hearts. As their awareness of letters and sounds grows over the year, 4-year-olds begin sorting objects or pictures based on the first sound they hear, and some use those initial sounds to try writing words on their own. Explicit reading and writing instruction begins in the 5s. At the beginning of the year, children of this age already have a strong relationship with literature — they can retell familiar stories and use picture clues to help them narrate favorite books. They use drawings to compose their own true and imagined tales. As the year progresses, they build knowledge of how written language works to become increasingly skillful and independent as readers and writers. By the end of the year they are able to express themselves through writing and are able to read simple books on their own. Typical genre studies for the 5s include All-about Books, Personal Narrative, and Poetry. 6s anticipate becoming more skillful readers and writers over the course of the year and have high expectations for themselves. The logistics of reading and writing are still new and challenging for six-year-olds, but they are highly motivated to become more independent. As children become able to read more challenging books on their own, they still view reading as something to love and to share with others. The 6s continue to use a balanced literacy framework of reading workshop, writing workshop, small group work, word study, shared reading, and read-alouds. Students write for a variety of purposes and begin to return to their written pieces for the purpose of revising and editing. 6s typically revisit familiar genres, gaining experience writing narrative fiction and writing more expressively and playfully. Make connections to stories and poems. elements in a genre like fairy tales. Identify letters and recognize letter-sound correspondence. Notice and generate rhyming words. Recount and compose stories orally. Use writing and drawing tools competently. Integrate decoding and comprehension skills to read with purpose and meaning. Recognize “narrative arc” of stories and incorporate into own compositions. Use writing to capture a moment, or share ideas. Recognize and use the conventions of a variety of genres. Use the writing process to generate ideas, draft, revise and edit, and share their writing. Write sentences with beginning capitals and ending punctuation. How do letters combine to make words? How can I use language to share my ideas? How can I keep a clear picture in my mind of what I’m reading? What can I do if I begin to lose that picture? What techniques do published authors use that I can try myself? What are some similarities and differences between poetry and prose? Narrative fiction and narrative nonfiction? How-to books and All-about books? 7s are increasingly fluent and nuanced readers and writers. Reading and writing are approached joyfully and pursued independently; however, the class also builds strong community around literacy, forming discussion groups around shared books or series, or giving each other carefully considered feedback about written work. Students continue to refine their writing skills with a new emphasis on revision for content and style. Key genre studies in the 7s are typically personal narratives, how-to books, and fantasy. Working in the contexts of whole-class book discus- sions, small, independently run book groups, and partnerships, 8s discuss what they read. They reflect on various aspects of their books: sharing exciting moments, identifying a problem in a story, making inferences, identifying common themes, and creating book recommendations. In addition, 8s gain skills in note-taking and analysis of nonfiction texts as they examine books about history, as well as primary source documents connected to their work in social studies. In the writing workshop, students learn to follow the steps of the writing process more independently to find their unique voices. Genres studied include memoirs, interviews, letter writing, biographies, historical fiction, and persuasive writing. Students in the 9s approach reading and writing with greater independence and purpose. Much of the work they do is integrated with social studies and science, as students become more adept at analyzing and creating nonfiction texts. 9s are also cultivating a deeper love of literature, with the ability to sustain whole-group or small-group discussions around books with more sophistication and independence. Typical experiences include: an integrated reading and writing unit on award-winning picture books; a workshop structure that supports children in their independent reading; and experience in writing a variety of genres, with an emphasis on narrative, persuasive, and in- formative writing. The 10s continue to practice and improve foundational reading and writing skills, with an emphasis on critical thinking and analysis. Students compare and contrast a variety of genres and strengthen their comprehension of complex texts. As writers, 10s refine their awareness of audience and purpose. They write in a variety of nonfiction forms, including persuasive pieces and research reports. They strengthen research skills such as note-taking, collecting and analyzing information, prioritizing and organizing, and presenting information in clear and engaging ways. Read and write with fluency and stamina across a variety of genres. Identify themes in literature and the different ways authors develop those themes. Strengthen writing by planning, revising, editing, and publishing a piece of work. Integrate reading and writing skills by conducting research and presenting findings. Engage with peers in conversation to express one’s own ideas clearly and persuasively, and to actively respond to the ideas of others. Demonstrate increasing mastery of the conventions of standard English grammar, usage, capitalization, punctuation, and spelling. Why do so many stories seem to have heroes and villains? How can I read between the lines to figure out what is really motivating these characters? How can I capture my readers’ attention and keep them engaged in my story? What pieces of information will be most persuasive as I build a written argument? What discussion questions will help my book club understand the story on a deeper level? Why do some themes in literature recur frequently?